Call for Best Deals !! Omaxe Heights of Omaxe is located in Sector 86, Faridabad and is in close proximity to several prestigious gated communities, reputed schools and shopping malls. Presenting fully quipped flats that are beautifully crafted 2BHK, 3BHK and 4BHK apartments. Sector86 is in proximity to all the civic utilities like banks, medical units and major educational institutes. Due to the presence and growth of the automobile and manufacturing, the city of Faridabad enjoys enormous footfalls of professionals from the entire nation. The robust infrastructure and the improvement in the connectivity throughout the whole city make it a favorite location for the investors and buyers. In which area is Omaxe Heights located?The project is situated in Sector 86, Faridabad. What is available flat size in Omaxe Heights?  Flat sizes in the project range from 1165.0 sqft to 2350.0 sqft. What is size of 2 bhk in Omaxe Heights? 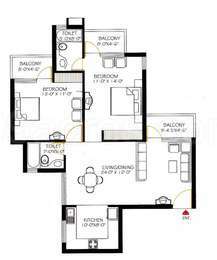 The area of 2 BHK apartments ranges from 1165.0 sqft to 1210.0 sqft. What is the area of 3 bhk in Omaxe Heights? Three-room units (3BHK) in the project are available in an area of 1475.0 sqft to 1500.0 sqft. What is the 4 bedroom size in Omaxe Heights? Four-room units (4BHK) in the project are available in an area of 2350.0 sqft. What is price of 2 bhk in Omaxe Heights? 2 BHK apartments in the project are available at a price of Rs. 3992455 to Rs. 4146670. 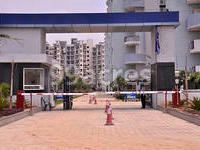 I work in Faridabad and have heard a lot about Omaxe Heights in Sector-86, Faridabad project from my friends. Just wanted to know if its kids friendly and some of the other amenities are on offer? I am looking to purchase an apartment here for self use. Flats avilable for sale near vishwapriyanagar which is 5 Km from electronic city are you intrested . Mr. Ekant, keeping in mind the evolving trends in societies, the builder has taken special provision for kids. There is a designated childrens play area where kids can play and a toddlers pool for swimming. Sports facilities such as badminton, basketball, lawn tennis and squash court along with a room for table tennis are also being provided by the builder. Besides, plans of equipping the project with entertainment and recreational zones like a banquet hall and sauna spa are also being talked about. I suggest you to take site visit of the property and consult the residents as they will be able to tell you more about the amenities. Me and my wife work in Faridabad and have to commute daily from Delhi. 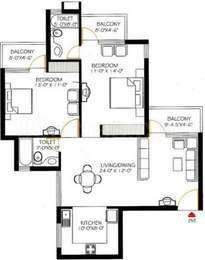 We are looking for 2BHK rented accommodation in this project. Please guide me about the same. How much are the monthly maintenance charges?